(The Sports Xchange) – Klay Thompson scored 41 points to lead the Golden State Warriors to a 108-101 victory over the Oklahoma City Thunder on Saturday at the Chesapeake Energy Arena in Game 6 of the Western Conference Finals. 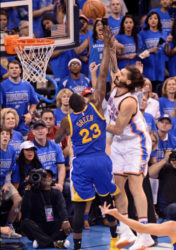 Draymond Green of the Golden State Warriors attempts to block the dunk attempt of Oklahoma Thunder’s Steve Adams. Thompson hit 11 of 18 from 3-point range to set a new NBA playoff record. Steph Curry scored 29 to go along with 10 rebounds and nine assists. Draymond Green scored 14 points, grabbed 12 boards and had three steals. Kevin Durant led the Thunder with 29 points on 10 of 31 shooting. Russell Westbrook posted 28 points, 11 assists and nine rebounds. Serge Ibaka added 13 points and nine rebounds. The series is tied at 3-3 with Game 7 taking place on Monday in Oakland, California. Westbrook put the Thunder up 93-87 with 6:22 left in the fourth quarter. After the Thunder forced a stop, Steven Adams made 1 of 2 from the free-throw line. Thompson drove the lane for a layup to slice lead to 94-89. But Durant responded with a jumper. Thompson drained his 10th 3-pointer of the night. After Oklahoma City’s Andre Roberson made 1 of 2 from the line, the Thunder led 97-92 with 4:32 left. Curry with a 3-pointer brought the Warriors to within 1 at 97-96. But Westbrook went to the free throw line and buried a pair to push lead back to three with 3:42 on the clock. Durant was forced into a turnover and it led to Curry’s game-tying 3-pointer making the score 99-all. Roberson and Andre Iguodala traded baskets before Thompson banged in another 3-pointer to put the Warriors ahead 104-101. Thompson missed a 3-point attempt and Durant got the rebound. But he turned the ball over and Curry made the Thunder pay with a layup to put the game away. The Thunder made 22 of 32 from the foul line while the Warriors hit 21 of 44 from behind the arc. Green showed early on that he was out of the funk that had plagued him the first four games of the series. He tallied six points, four rebounds and two assists in the first quarter alone. But that did not seem to affect the Thunder. Even with Durant shooting a low percentage, they were able to go ahead by 13 in the second quarter. Much of that was built on the play of the Oklahoma City big men. Enes Kanter came off the bench to produce offensive while Adams was effective on both ends. 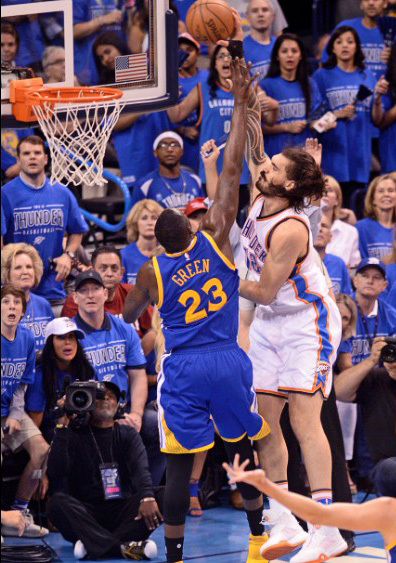 That included throwing down a dunk over Green that had the Thunder bench falling over themselves celebrating. If not for Thompson, the Warriors could have found them in trouble. He shot 4 of 8 from 3-point range as Golden State only tailed 53-48.